When Jason Gould had the opportunity to provide public art for North Park, he wanted to paint murals for the community. Instead, the owner of North Park supply shop Visual had to settle for something smaller. “(The community board) told me, ‘Well, we have these electrical boxes, and you can start painting them if you’d like,’” he said. The small-scale project commissioned by the North Park Main Street organization eventually formed into the Visual Public Art Project, led by Gould. Since its beginning in 2013, the project has showcased and promoted the creative talent of San Diego artists throughout North Park and its neighboring communities. 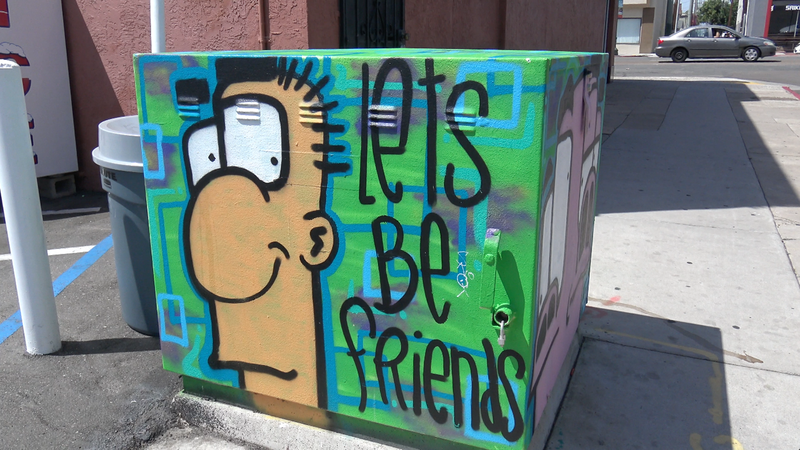 North Park already had artworks on electrical boxes before Visual moved into the neighborhood in 2013, but the art had been neglected for a while before Gould took charge of the project, Gould said. As he got settled into the community, North Park Main Street asked Gould if he wanted to work on new artworks for the electrical boxes. The project got off to a rather rough start, however. Gould worked around the process and began commissioning artists on his own, “guerrilla style.” Gould and his artists received positive feedback from the board and community members. The following for the electrical box art project has grown during the past few years, thanks to Instagram. 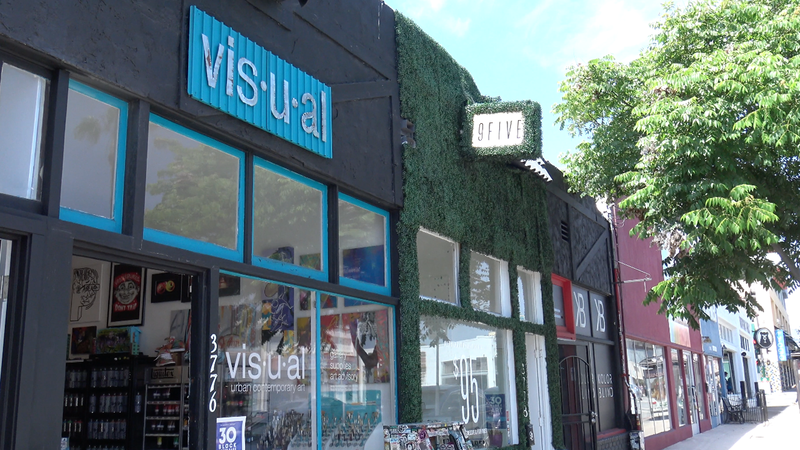 Along with social media, the Visual store front has also been a helpful venue for Gould to network with local artists. Frieda Gould, no relation to Jason, who creates street art as Kurznachzehn, stepped into Visual to buy spray cans during her first visit in San Diego in 2012. After she shared about her experience as a street artist in Germany, her home country, she was asked if she wanted to paint a few electrical boxes. The artist now works at the supply store to assist the Visual Public Art Project in choosing which artists to commission to create artworks for new electrical boxes. The Visual Public Art Project keeps the commission process flexible for the artists to give them creative freedom, Jason Gould said. He describes the general aesthetic the project members look for in an artwork as “urban contemporary art,” but the umbrella term covers many styles, from graffiti to pop art. The Visual Public Art Project is like a free, open gallery for local artists, Frieda Gould said. 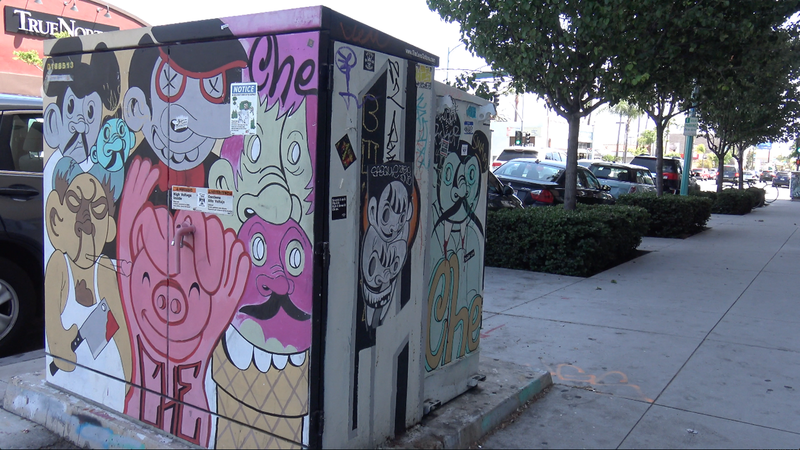 The artists can gain exposure from their work showcased on electrical boxes throughout North Park. Community members can also be more familiar with the artists when they see their work in other events, Jason Gould said. After its success in North Park, Visual Public Art Project later expanded to work on electric boxes in Normal Heights, City Heights and along El Cajon Boulevard. Because of an increase in submissions, they now have to be more selective with their artists, Jason Gould said. “I’m glad an entity like Visual supplies is taking care of logistics and distribution of artists for the boxes because I trust their eye and have a good pulse on the artists,” said Edwin Negado, owner of apparel shop Gym Standard on El Cajon Boulevard. Frieda and Jason Gould are currently working to paint boxes in the College Area. The two have a new project underway to have artists paint 10 boxes on the campus of Platt College.